Coasters can be fun for all ages. Roller coaster rides are a staple attraction at fun centers, amusement parks, carnivals, and even smaller venues such as zoos and school fairs around the world. 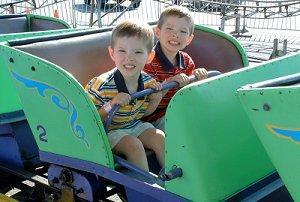 Having a fun ride on these scream machines, however, requires more than just strapping in. For many locations, a roller coaster is a star attraction and delivers hundreds or thousands of rides each day to visitors of all ages. Some coasters are simple family tracks with gentle dips and curves, while others are high tech scream machines that feature the latest roller coaster design innovations including inversions, stadium seating, open-air vehicles, quick launch mechanisms, magnetic brakes, and more. Whether you are interested in just a fun ride or a true adrenaline rush, there is a roller coaster right for you. Loops can be hazardous for riders with health problems. Every roller coaster will have different requirements for riders based on the nature of the ride, the available safety systems, and other factors. Riders who are uncertain about their ability to ride properly and safely should contact the amusement park or coaster manufacturer for further guidelines before attempting to ride. Watch the ride before entering the line. Note how fast it moves, how people react to it, and what elements are part of the track to decide if you're interested in riding. Plan your ride to take advantage of shorter lines. Coasters closest to a park's entrance and the larger, more popular rides will have longer lines early in the day, while all lines may shrink during popular show times and meals. Some rides, such as the coasters at Cedar Point amusement park, will post estimated wait times at the ride entrance for guests' convenience. Avoid any roller coaster rides immediately after a big meal or if you are feeling ill in any way, including nausea or headaches that can be exaggerated by the ride. Listen to instructions and automated announcements while you are waiting in line. They will give guidance on how to safely and quickly board the ride as well as how to ride properly. Secure all loose articles before riding. Some rides have lockers nearby, while others may permit riders to leave items in the station while they ride. Some roller coasters may require that items be left with a non-rider. For most rides, it is a good idea to secure all items - wallets, keys, sunglasses, hats, cell phones, etc. - inside a zippered or tightly fastened pocket to avoid losing anything on the ride. Sunglasses and prescription glasses can be secured with a tight-fitting strap to ensure they don't fall off. Secure the safety restraints properly. Seat belts should be snug, and lap bars should be firmly against the legs. Shoulder harnesses should be firmly against the chest and shoulders. By being prepared for the ride, you can have a safe and fun experience on any type of roller coaster. 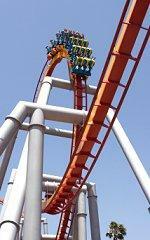 Riders who are nervous about new roller coasters can take steps to have a great ride without being scared. Watch the ride first to become familiar with how it moves, and note the expressions and emotions of riders exiting the ride. Start with smaller rides that you can be more comfortable with before building up to larger coasters. Secure the restraints firmly and hold on to grab bars to feel extra secure while riding. Take deep breaths to keep calm and close your eyes if that helps. Feel free to scream to release your anxiety and share your excitement while riding. Above all, nervous riders should never feel pressured to try a ride they don't want to be on. All roller coasters are meant to be fun, but they aren't necessarily fun for everyone. It is important to note that roller coaster accidents do occur, but they are rare. By following proper roller coaster safety tips, riders can have a good time and there will be no need for a theme park accident attorney. Roller coasters are beautiful, graceful, powerful machines, and experienced coaster enthusiasts know that roller coaster rides can be relaxing and thrilling at the same time. By knowing how to enjoy a ride safely and effectively, it is possible to circle the track many times with a smile.